Introduction: Distractions in the operating room not only can negatively affect the surgeon’s performance, but are also important contributing factors to surgical errors. In order to reduce the impact of distraction, feedback could be included in training. Specifically, intermediate feedback can provide objective information to participants between trials to reduce performance errors and improve skill acquisition. However, the role of feedback in counteracting distraction has not been well defined. 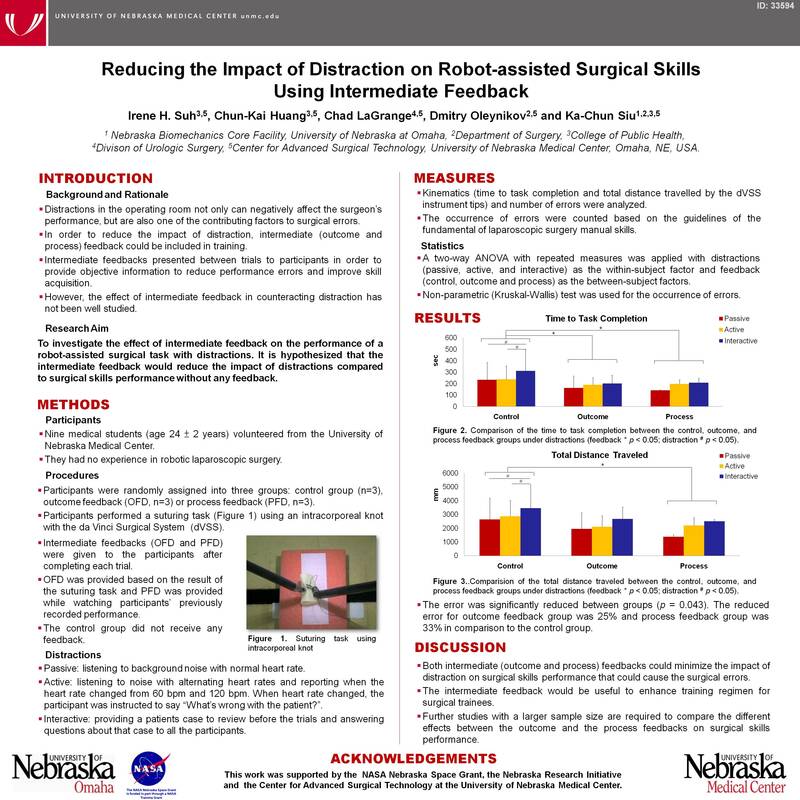 The objective of this ongoing study is to investigate the role of intermediate feedback on the performance of robot-assisted surgical tasks with distractions. It is hypothesized that the intermediate feedback would reduce the distraction impact on performance compared to the control group. Method: Six participants were randomly assigned into three groups: outcome feedback (OFD), process feedback (PFD) and control group. All participants were exposed to three different distractions: passive (listening to background noise with normal heart rate), active (listening to background noise with alternating heart rate) and interactive (reviewing a patient’s history and answering questions of the history). Participants performed a suturing task using intracorporeal knot with the DaVinci Surgical System (dVSS). Intermediate feedbacks (OFD and PFD) were given to the subjects after completing each trial. PFD was provided while watching participants’ previously recorded performance and OFD was provided based on the result of the suturing task. The control group did not receive any feedback. Kinematics (time to task completion and total distance travelled of the dVSS instrument tips) and number of errors were analyzed. The percentage of reduction of distraction impact on skill performance was calculated. A two-way ANOVA with repeated measures was applied with distractions (passive, active, and interactive) as the within-subject factor and feedback (OFD and PFD) as the between-subject factors. Results: Both intermediate feedbacks reduced the impact of distraction in comparison to the control group by 29% in the time to task completion and 27% in the total distance traveled. No differences were found between two feedbacks. The error rate was also reduced by 33% for PFD group and by 25% for OFD group in comparison to the control group. Participants in PFD group showed more reduction in error rate (37%) in comparison to OFD group. Conclusion: The intermediate feedback could minimize the impact of distraction on surgical skills performance that could cause the surgical errors. The intermediate feedback would be useful to enhance training regimen for surgical trainees. Further study with a larger sample size is required to compare the different positive effect between the outcome and process feedbacks on surgical skills performance.